This summer we unselfish Italians decided to not participate to the World Cup to give another country the opportunity to win (good luck with that England!). This decision, which I strongly support, gives me lot of time for blogging! 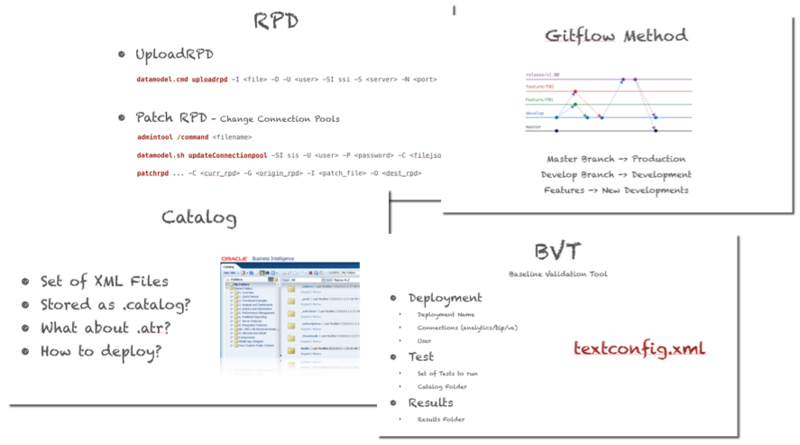 As already written, two weeks ago while in Orlando for Kscope18, I presented a session about DevOps and OBIEE focusing on how to properly source control, promote and test for regression any component of the infrastructure. One key aspect of DevOps is providing the Development Isolation: a way of allowing multiple development streams to work independently and merging the outcome of the process into the main environment only after this has been tested and validated. This is needed to avoid the standard situation where code promotions are blocked due to different working streams not being in sync: forcing a team to postpone a code release just because another team doesn't have the UAT OK is just an example of non-isolated development platforms. We have been discussing development isolation topic in the past focusing mainly on concurrent repository development and how to integrate it with versioning tools like Git and SVN. The concurrent online editing option is not viable since multiple developers are modifying the same artifact (RPD) without a way of testing for regression the changes or to verifying that what has been done is correct before merging the changes in the RPD. Alternative solutions of using MUDE (default multi-user development method provided by the Admintool) or pure offline RPD work encounter the same problems defined above: no feature or regression testing available before merging the RPD in the main development environment. Different RPD development techniques solve only partially the problem: almost any OAC/OBIEE development consist at least in both RPD and catalog work (creation of analysis/dashboards/VA projects) we need an approach which provides Development Isolation at both levels. The solution, in order to properly build a DevOps framework around OAC/OBIEE, it's to provide isolated feature-related full OBIEE instances where the RPD can be edited in online mode, the catalog work can be done independently, and the overall result can be tested and validated before being merged into the common development environment. The feature instances, as described above, need to be full OAC/OBIEE development instances where only a feature (or a small set) is worked at the time in order to give the agility to developers to release the code as soon as it's ready and tested. In the on-premises world this can "easily" be achieved by providing a number of dedicated Virtual Machines or, more in line with the recent trends, an automated instance provisioning with Docker using a template image like the one built by our previous colleague Gianni Ceresa. The overall OAC instance cost can be mitigated by the Bring Your Own License (BYOL) licensing method which allows customers to migrate on-premises licenses to the cloud and have discounted prices on the hourly/monthly instance cost (more details here). However, since the target is to minimize the cost thus the # of instances and the uptime, we need to find a way to do so that doesn't rely on a human and a point and click interface. Luckily the PaaS Service Manager Command Line Interface (PSM Cli) allows us to solve this problem by providing a scriptable way of creating, starting and stopping instances. PSMCLI is a command line interface acting as a wrapper over the PaaS REST APIs. 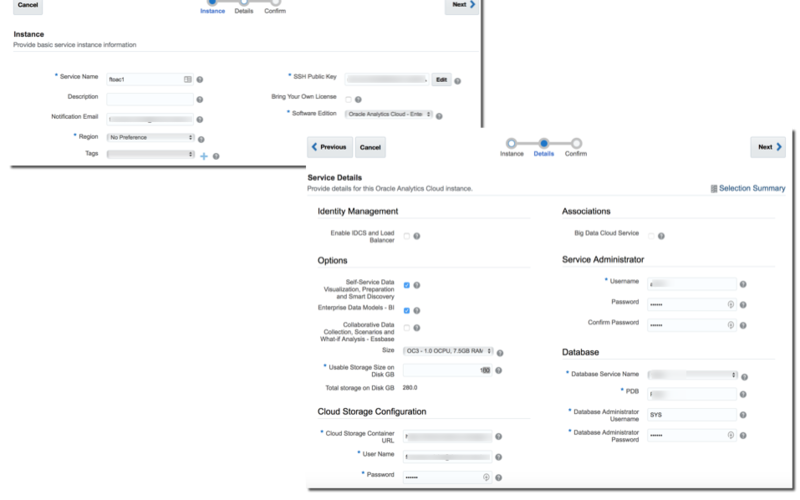 Its usage is not limited to OAC, the same interface can be used to create and manage instances of the Oracle's Database Cloud Service or Java Cloud Services amongst the others. When talking about OAC please keep in mind that, as of now, PSM Cli works only with the non-autonomous version but I believe the Autonomous support will be added soon. 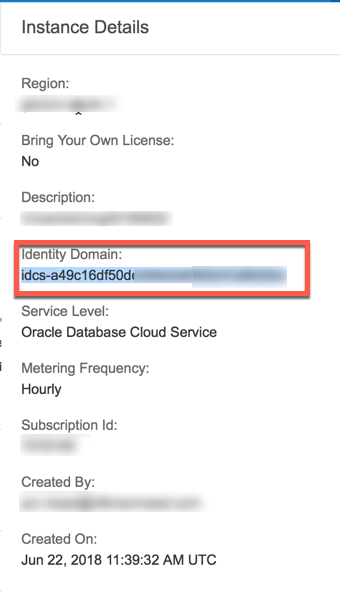 One quick note: the identity domain Id, shown in the Oracle Cloud header, isn't working if it's not the original name (name at the time of the creation). 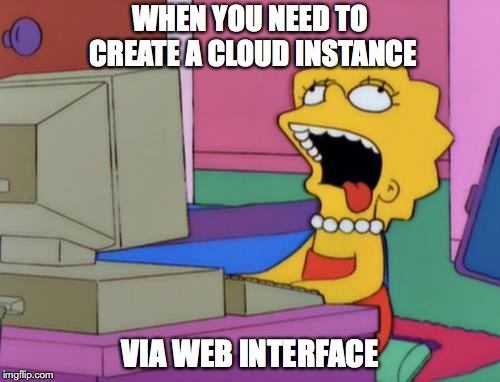 In order to get the correct identity domain Id to use, check in an Oracle Cloud instance already created (e.g. a database one) and check the Details, you'll see the original identity domain listed there (credits to Pieter Van Puymbroeck). Once the PSM has been correctly configured it's time to start checking what options are available, for a detailed list of the options check PSM documentation. Which in my example provides the Id of the Job assigned to the stop operation. When I check the status via the service command I get Maintenance like in the web UI. Access Control: lists, creates, deletes, enables and disables access rules for a service. Scaling: changes the computer shape of an instance and allows scaling up/down. How do I create a Config File for OAC? The documentation doesn't provide any help on this, but we can use the same approach as for on-premises OBIEE and response file: create the first instance with the Web-UI, save the payload for future use and change parameters when necessary. 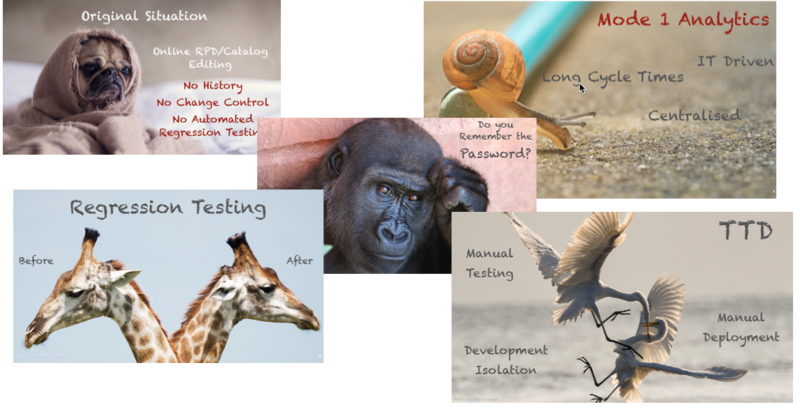 Worried about providing development isolation in OAC while keeping the costs down? Not anymore! With PSM Cli you now have a way of creating instances on demand, start/stop, up/down scaling with a command line tool easily integrable with automation tools like Jenkins. Create an OAC instances automatically only when features need to be developed or tested, stop&start the instances based on your workforce timetables, take the benefit of the cloud minimizing the cost associated to it by using PSM Cli! One last note; for a full DevOps OAC implementation, PSM Cli is not sufficient: tasks like automated regression testing, code versioning, and promotion can't be managed directly with PSM Cli but require usage of external toolsets like Rittman Mead BI Developer Toolkit. If you are interested in a full DevOps implementation on OAC and understanding the details on how PSM Cli can be used in conjunction with Rittman Mead BI Developer Toolkit don't hesitate to contact us! The @Forrester Wave™: Big Data Fabric, Q2 2018. @Oracle continues to broaden its Big Data Fabric solution and leads the pack.